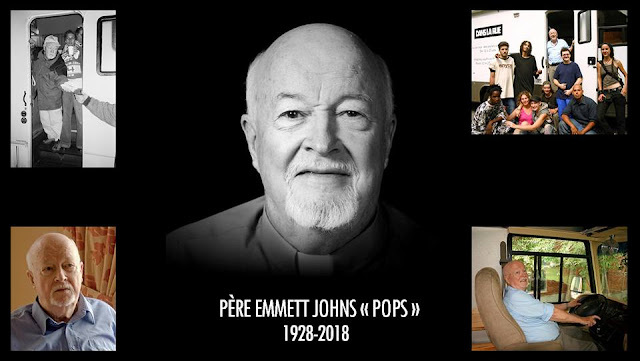 DLR Release: Dans la rue is deeply saddened to announce the passing of the organization’s founder, Father Emmett Johns, fondly known as “Pops,” on January 13th, 2018. He was ­­89. In 1988, at the age of 60 and after decades serving as a parish priest, Father Johns felt called to reach out to Montreal’s homeless youth. He took to the streets in a used motorhome, offering warm food and a sympathetic ear to hundreds of street youth. Dans la rue’s mission remains strongly rooted in Pops’ philosophy of dedication, empathy, and respect. His enduring legacy is one of acceptance without judgement and this legacy will continue to inspire and to guide the staff and volunteers at Dans la rue as they carry on his important work. "When I think back to the first nights I spent on the Van, never could I have imagined that Dans la rue would be what it is today… We have had an impact on tens of thousands of young lives - and we continue to reach out to more and more every day." - Father Emmett Johns, "Pops" The date of services in celebration of Father Johns' life will be communicated shortly. Father Emmett Johns, the street-smart Roman Catholic priest who founded Le Bon Dieu dans la rue in 1988, died peacefully on Saturday in a retirement home. He was 89. Johns, who was dubbed “Pops” by the street kids he befriended, founded a mission that provides shelter, support and hope to Montreal’s homeless and marginalized youth. Four hours after his death was announced on Facebook, more than 500 people had replied to the post, offering condolences or sharing stories about how Johns had helped them get off the street. In 1988, at the age of 60 and after decades serving as a parish priest, Johns dedicated his life to helping and raising awareness about Montreal’s homeless youth. He took to the streets driving a motorhome, and offered a hot dog, coffee and a sympathetic ear to hundreds of street youth. Over the years, the humanitarian organization expanded, opening a temporary shelter for homeless teens in 1993, and a day-centre in 1997, which serves as a high school and job training centre, and provides a variety of other social services to help at-risk teenagers. In 2014, Dans la rue opened 17 low-cost apartments in Hochelaga-Maisonneuve, fulfilling another of Johns’s dreams. In a 2013 opinion piece in the Montreal Gazette, the former executive director of Le Bon Dieu dans la rue said Johns lobbied government ministers, business leaders and philanthropists to raise funds to help street kids. “His dream was to build an organization that would offer real solutions for street youth,” Aki Tchitacov wrote. Johns wasn’t your ordinary priest. Pops sometimes packed a pistol and knew how to shoot. He was once a biker and a licensed pilot with a plane of his own. He suffered a nervous breakdown before starting his street mission for kids. Years later, he said he never would have believed the organization would become so successful. Emmett Mathias Joseph Johns, a longshoreman’s son, was born in Montreal on April 3, 1928. He was educated at St. Agnes elementary and D’Arcy McGee High School. Initially, he wanted to go to China as a missionary, but he was expelled after studying for four years with the Scarborough Foreign Missions Society, so he entered the Grand Seminary in Montreal. Ordained in 1952 at Mary Queen of the World Cathedral, he began his priesthood at St. Monica’s parish in Notre-Dame-de-Grâce. In the 1960s, he was at Our Lady of Fatima in St-Laurent, before being appointed chaplain at both Marian Hall, a protective home for girls, and the Douglas Hospital in Verdun. He was also the parish priest at St. John Fisher in Pointe-Claire, and at the Church of the Resurrection in Lachine. The death of two nursing students who drowned while attending a retreat in the Laurentians where Johns was preaching in 1968 had a profound effect on him. He experienced deep depression, and following a Jewish custom of mourning, decided not to shave for a month. He kept the beard until his death. While struggling to come to terms with his loss, he served as chaplain at Bishop Whelan High School and at Queen of Angels Academy. In 1972, Johns founded the Provincial Association of Teachers of Ethics and Religions and completed his arts degree in theology and psychology at Loyola College in 1974. Johns was also a licensed pilot who flew his own Cessna 182 for 16 years to “take my mind off earthly problems.” Hospitalized as the result of a nervous breakdown in 1987, he discovered the diocese didn’t make it easy for him to continue his ministry once he had regained his health. He took his inspiration from a verse from the Gospel of St. Matthew: “Whatever you did for one of the least of these brothers and sisters of mine, you did for me.” He sold his plane, borrowed an additional $10,000, and in 1988 began a street ministry, Le Bon Dieu dans la rue. He prowled the streets in a van after dark to provide food, medication and guidance to teenage runaways and other homeless youngsters. The kids he worked with called him pops, and the moniker stuck. He also opened The Bunker, a shelter for youngsters with nowhere else to go. Johns received an honorary doctorate from Concordia University in 1997 and was given Canada’s highest civilian honour, the Order of Canada, in 1999. He was invested with the Order of Quebec in 2003. He placed fifth on a list of the 10 most-admired Quebecers compiled in 2004 by the French-language magazine 7-Jours, the only clergyman to make the grade. In the Montreal Mirror’s annual poll, he was consistently chosen as the Montrealer closest to heaven. A funeral date has not yet been set.